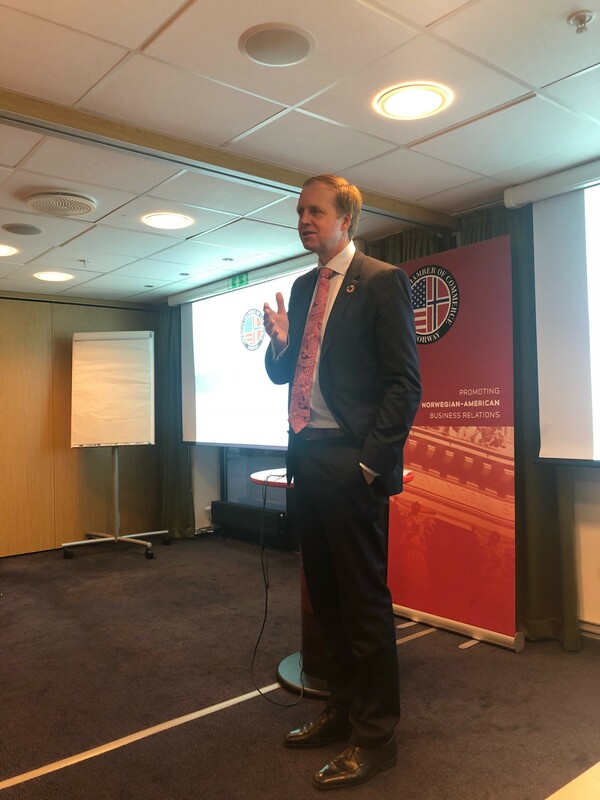 “The carrot works better than the stick when motivating companies to develop a pro-sustainability agenda,” guest speaker Jens Frølich Holte from the Ministry of Foreign Affairs told participants during AmCham’s recent Sustainability Forum. Highlighting the importance of collaboration with the private sector, State Secretary Frølich Holte shared insights into the Norwegian Government’s efforts toward reaching the UN’s Sustainable Development Goals (SDGs) with senior representatives from AmCham members Coca-Cola, DNV GL, InterimLeder, Fast Solutions, Gelato, McDonald’s, Umoe Restaurants, Radisson and Roche. Following upon the success of our inaugural meeting, AmCham’s Sustainability Forum brings invited cross-industry member company representatives together to openly discuss opportunities and challenges, share best practices and determine how AmCham members can best play a role in the Norwegian sustainability agenda going forward. For clarity in future Forum initiatives, participants agreed in principle that corporate sustainability is the systematic, long-term management and coordination of environmental, social and economic principles to ensure responsible, ethical and lasting business success. Bjørn Haugland, Chief Sustainability Officer, presented DNV GL’s holistic approach to sustainability efforts within his organization, which works within 25 different industries in more than 100 countries. “Running a sustainable company creates better opportunities while also serving your customers’ needs better, as there is a growing global demand from consumers for more sustainable business practices,” Haugland added. 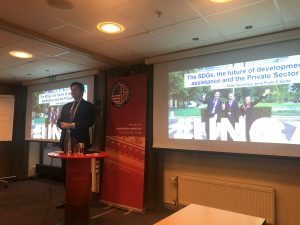 State Secretary Frølich Holte went on to explain that since the establishment of the Sustainable Development Goals, there has been a significant change in rhetoric regarding development aid. “With international political support for SDG’s wavering, the private sector is now driving developments. Aid is being woven into company strategies with increased emphasis on voluntary partnerships,” he said. A negotiated and universal agenda consensus – driven by 193 UN member states – is key to achieving the SDGs, and the State Secretary encouraged the private sector’s continued involvement in, and pioneering of, the sustainability agenda going forward. AmCham’s Sustainability Forum was introduced earlier this year, with the next meeting scheduled for February 2019. Please contact us for interest in future forums.